The city now known as İstanbul has been the capital of empires, settled since well before history first began to be recorded. It has a beautiful and strategic setting on the Bosphorus strait joining the Black Sea to the Aegean and Mediterranean. Just like the song says, İstanbul was Constantinople. Going way back, there was a Neolithic settlement beneath today's Yenikapı district on the shore south of the central Fatih and Sultanahmet districts. The settlement dates back to around 6700 BC, before the Bosphorus had formed to connect the Black Sea to the Aegean. No one can know what the inhabitants called the place, though, as this was before the development of writing. It was, however, important during the development of agriculture, the Neolithic Revolution. Agriculture and the associated societal development spread from the Fertile Crescent, one of its main areas of origin, through this area and then west and north throughout Europe. Two thousand years later but still deep into prehistory, the Fikirtepe mound on the Anatolian side dates from the Copper Age, with artifacts dating to 5500-3500 BC. Then some Thracian tribes founded a port settlement named Lygos on the European side, on the point just below Topkapı Palace, near Sirkeci train station. That was around 1300-1000 BC. Getting into historical times, Kadıköy has remains of a Phoenician port from the time when it was known as Chalcedon. 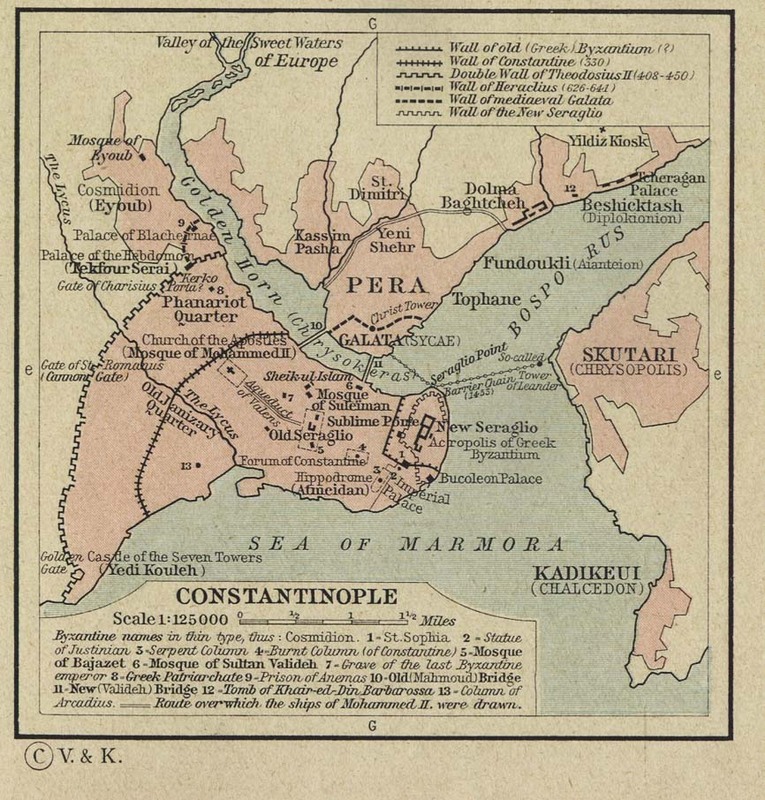 The Greeks colonized Βυζάντιον (or Byzantion) on the European side of the Bosphorus in 667 BC. Byzantion, later Latinized as Byzantium, became the second city of the Roman Empire, and then when Rome fell (or just faded away), the "Roman Empire" lived on for centuries, ruled from Byzantium. That's why it was called the Byzantine Empire. The city was renamed Κωνσταντινούπολις, Kōnstantinoupolis or Constantinople, after Constantine the Great. He lived 280-337 AD, and was Emperor 306-337. Constantine was the first to refer to the city as "New Rome", and his rule was when the eastern capitol really became the main base of power. Some Byzantine writers used both names, using Byzantium to emphasize its pagan roots and Kōnstantinoupolis to emphasize its connection with Christianity. The Medieval Greeks commonly referred to it as εις την Πόλιν, or is tin Pólin, "in the City". In modern Greek that's στην Πόλη, stin Póli. The Ottoman Turks captured the city in 1453 and started calling it İstanbul, based on the local use of εις την Πόλιν. 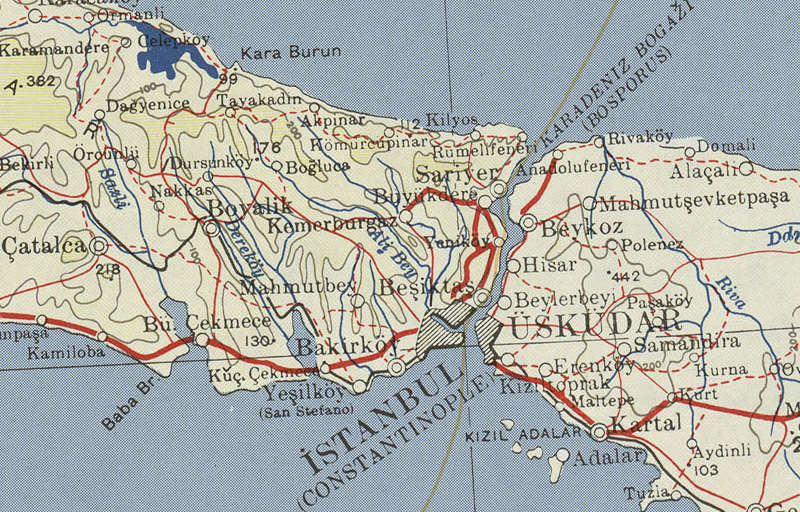 However, İstanbul didn't become its official name until 1930! The Turkish authorities officially requested that everyone start calling the city İstanbul, and the Turkish postal service stopped delivering letters and packages addressed with the older name. 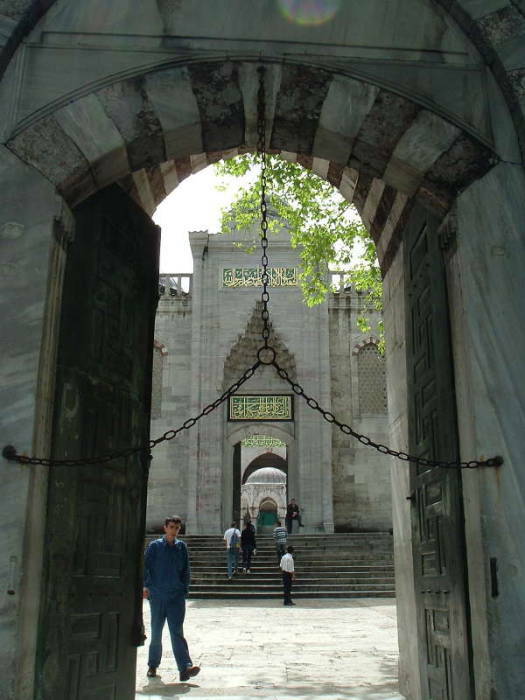 Other governments had been referring to the Ottoman government using the terms Dersaadet and Derâliye (Gate of Felicity) and Bâb-i Âlî (The Sublime Porte), referencing the gate where foreign ministers would apply to meet with Ottoman representatives. This is like saying "the White House" to refer to the U.S. government. The Greeks persist in calling it Κωνσταντινούπολις. For example, the train station in Thessaloniki has a schedule of trains to Kōnstantinoupolis but shows no service to İstanbul. Hagia Sophia is one of the greatest examples of Byzantine architecture. The current building dates from the 530s, and it was the largest Christian church in the world for about a thousand years. Then it suddenly became the largest mosque in the world. The full original name is the Church of the Holy Wisdom of God. In the original Greek it's Ναός τής Αγιας τοϋ Θεοϋ Σοφις, or more simply, Αγια Σοφια or Hagia Sofia. 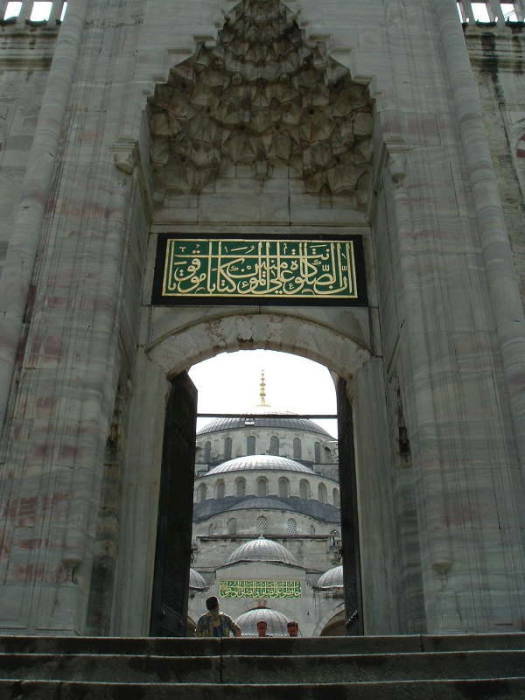 The Turks spell this Aya Sofya, which you sometimes see as one word, Ayasofya. 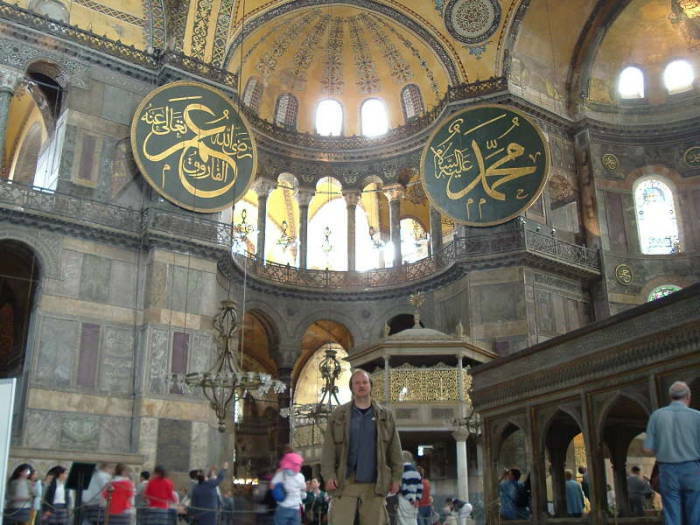 Hagia Sophia is Greek for Holy Wisdom, it's not named after some "Saint Sophia." But it happened that "Sophia", Greek for "wisdom", because a popular woman's name, including a few women who became designated as saints. The first church was built here starting in February 360 during the rule of Constantine's son, Constantinus II. It was called the Μεγάλη Έκκλησία, the Megálē Ekklēsíā or "Great Church". This was the main church of the city, really the primary church of all the Roman Empire, as Rome itself was well into its decline by the mid 300s. It was the seat of the bishop, an office that evolved into the Patriarch of the Eastern Orthodox Church. The great theologian John Chrysostom got into a squabble with Empress Aelia Eudoxia, the wife of the Emperor Arcadius, and was sent into exile in June 404. That led to riots, in which the Great Church was destroyed by fire. Emperor Theodosius II began building a replacement in October 415. It lasted until the riots of the Nika Revolt in January 522, in which it was completely destroyed by fire. The Byzantine Emperor Justinian I built the current Hagia Sophia in 532-537 AD. It was the largest Christian church in the world for about 1000 years, until the completion of the Medieval Seville Cathedral in 1520. The emperor appointed a physicist, Isidore of Miletus, and a mathematician, Anthemius of Tralles, as the architects. I'm sure that there was some specification for fire-proof construction, given the history of structures on the site. Over ten thousand construction workers were employed. Construction material was brought in from all over the Byzantine Empire: columns from the ruins of the Temple of Artemis at Ephesus and from the temple of Baalbek in Lebanon, large pieces of porphyry stone from Egypt, green marble from Thessaly, and yellow stone from Syria. The granite columns are 19 to 20 meters tall and at least 1.5 meters in diameter, some weigh well over 70 tons each. Earthquakes in 553 and 557 damaged the main dome and eastern half-dome, leading to their collapse in an earthquake in 558. The nephew of the original physicist-architect, Isidore the Younger, was directed to redesign and replace the dome. The result used lighter materials and was a little higher, giving the dome its current shape and size in 562 — an interior height of 55.6 meters and diameter of about 31 meters. 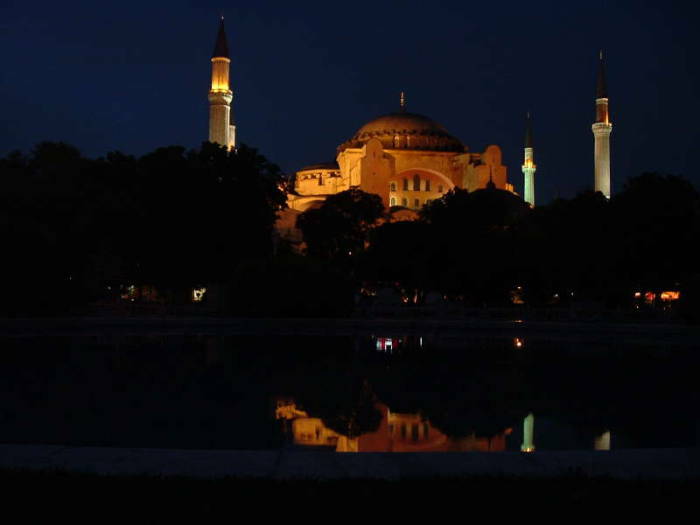 It was the seat of the Patriarch of Constantinople and the religious home of the Orthodox Byzantine Empire. It is the church in which western Cardinal Humbert in 1054 delivered a document from the Roman Pope excommunicating the Byzantine Patriarch Michael I Cerularius, kicking off the Great Schism and the division of the church into Roman and Eastern divisions. It was also the principal site of Byzantine imperial ceremonies, such as the crowning of a new emperor. The church contained a large collection of holy relics and many great works of art. In Byzantine times these included relics purporting to be: a stone from Jesus' tomb, the Virgin Mary's milk, the shroud of Jesus, and the bones of several saints. 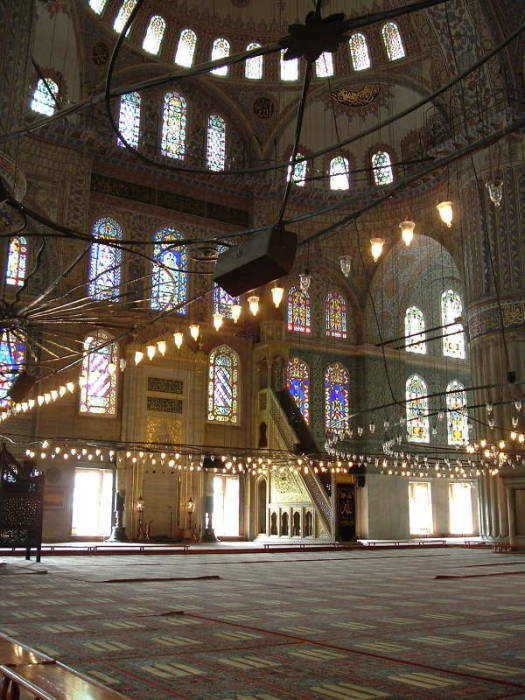 With the conquest of İstanbul by Mehmet the Conqueror in 1453, it became one of the largest mosques in the world. The bells, altar, iconostasis, and other overtly Christian furnishings were removed. Many of the fine mosaics were plastered over, rather than being destroyed. Continuing the theme of using material from all over the empire, now the Ottoman Empire, Sultan Murad III added some large urns, about three meters tall, carved from single blocks of marble from Pergamon. 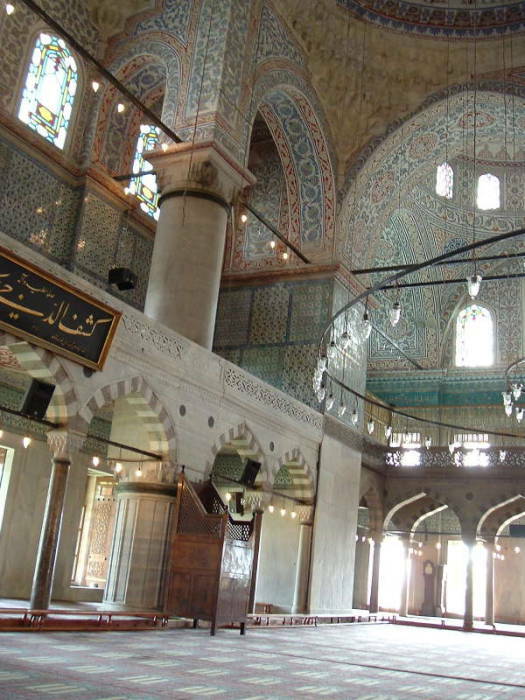 When the Turkish Republic was established, the Aya Sofya mosque was closed in 1931. It was reopened as a museum in 1935. 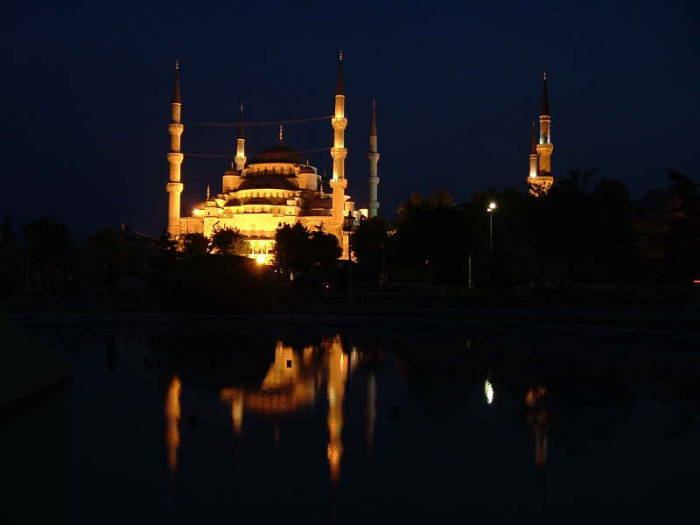 The four large minarets were added during Ottoman times. One is built from red brick, the other three from white marble. The slender marble minaret at the northeast (right rear as seen above) was erected by Sultan Bayezed II (ruled 1481-1512), and the two larger minarets on the west side (at left as seen above) by Sultan Selim II (ruled 1566-1574). The resulting interior is a mix of the original Byzantine church and the later Islamic mosque. 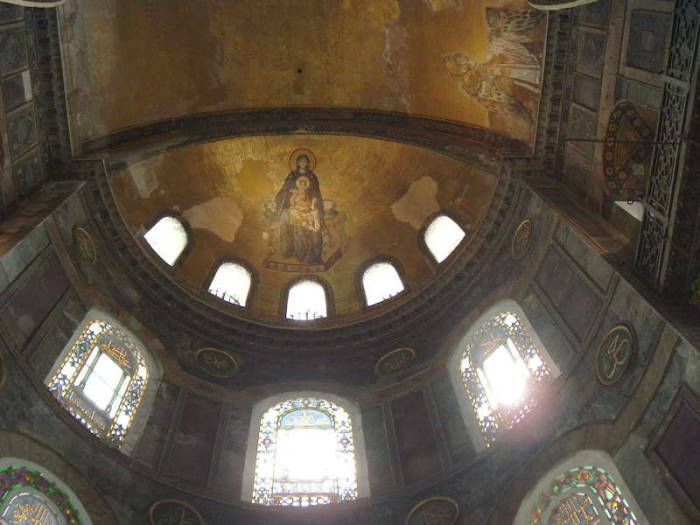 The semi-dome above the original Christian altar has a mosaic of Virgin and Child unveiled in 867. This is believed to be a reconstruction of a mosaic from the 6th century, destroyed during the Iconoclastic period when imagery was prohibited. Below are views across the floor of the main dome, showing the Christian imagery and the Islamic calligraphy. The famous Δέησις or Deësis, from the early 14 century, is one of the mosaics in the upper levels. There's a replica of it in the Metropolitan Museum of Art in New York. The Virgin Mary and John the Baptist are in three-quarters profile, imploring the intercession of Christ Pantocrator for humanity on Judgement Day. This piece is considered to be the beginning of the Renaissance in Byzantine art. During the Fourth Crusade, the military forces from western Europe didn't bother going all the way to Jerusalem before stopping to fight a religious war and desecrate local religious facilities. During the Sack of Constantinople in 1204, the Hagia Sophia was ransacked and desecrated — by the western crusaders! The church itself became a Roman Catholic cathedral during the Latin occupation of Constantinople in 1204-1261. Many of the relics and much of the precious metals and other valuables were taken back to western Europe. The Deësis was created to mark the time when the Latin crusaders were finally run out of Constantinople. 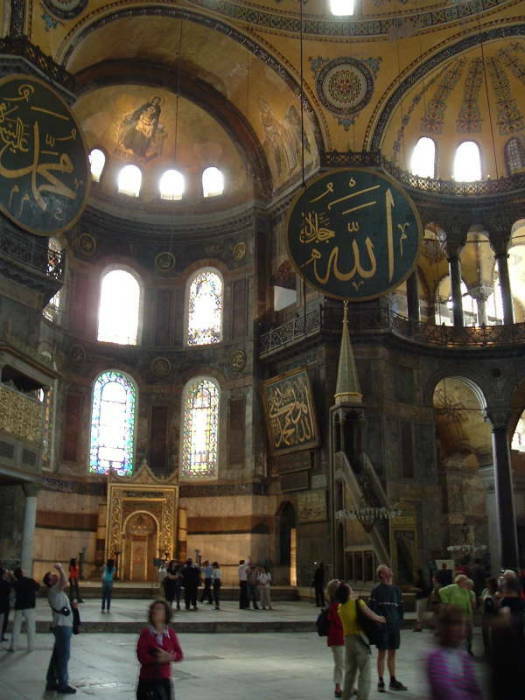 This meant the end of Roman Catholic use of the Hagia Sophia and its return to Orthodox use. The mosaic was probably completed in 1261, the year of that restoration. Jesus, clad in dark blue (as per the standard custom in Byzantine art) appears in one of the mosaics of Empress Zoe. He is seated in the middle, giving his blessing with his right hand and holding the Bible in his left hand. 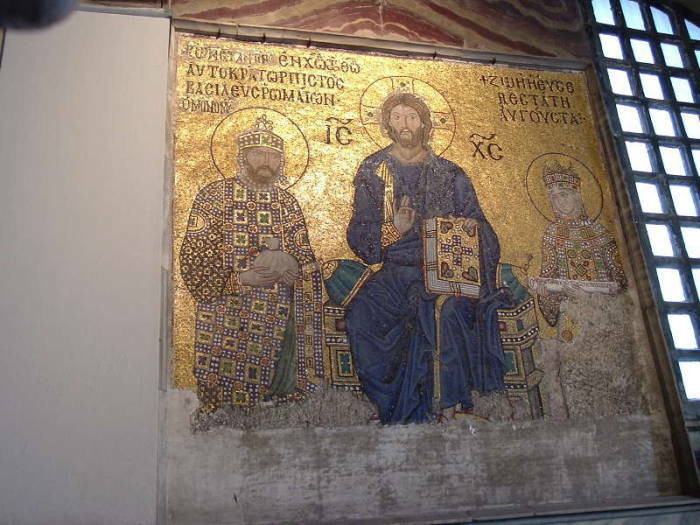 At the right is Empress Zoe, and at the left, Constantine IX Monomachus. Zoe went through several husbands, and this mosaic shows signs of heads of previous husbands being scraped off and replaced. 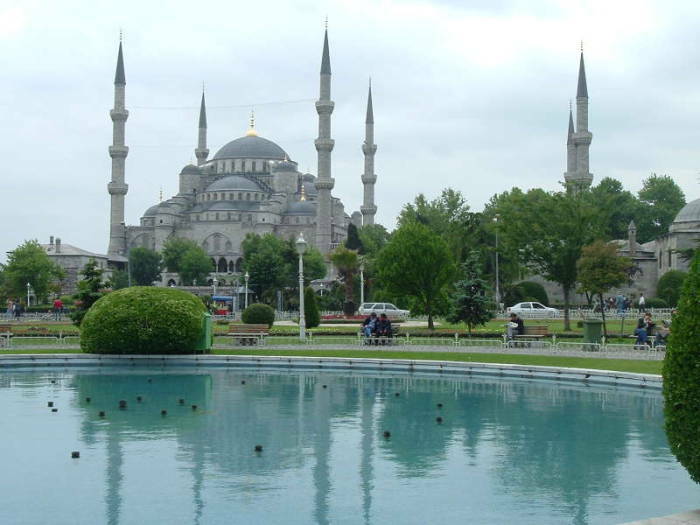 The Sultanahmet Camii, also known as the Blue Mosque, is directly across from the Aya Sofya. It's similarly spectacular but much newer, dating from the 1600's. It was built under the direction of Sultan Ahmet I during 1609-1616. The mosque grounds includes the tomb of its founder, a madrasah, and a hospice. 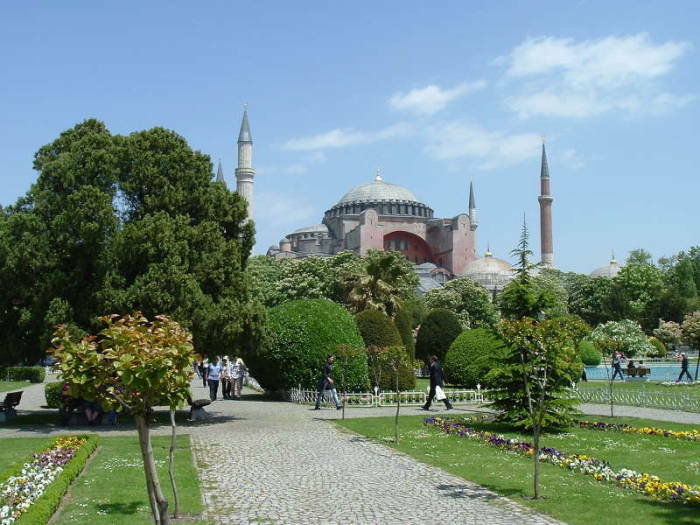 It was built on the former site of the palace of the Byzantine emperors, facing the Hagia Sophia across a park with fountains and many flower beds. This was a politically symbolic move — replace the palace and home of the Byzantine emperors with a large mosque. The design is spectacular but unusual, as it has six minarets. Four at the corners of the mosque itself, and two more at the corners of the forecourt. The design was controversial when it was first announced, as only the mosque of the Ka'aba in Mecca had six minarets. Sultan Ahmet's solution was to fund the construction of a seventh minaret in Mecca! You enter through the outer gate from the open plaza on the site of the ancient Hippodrome. You cross the outer courtyard, seen at in the first picture below, and enter through the inner gate, seen the second. Then you are in the courtyard of the mosque. An ablution fountain is at its center, and cool shaded stalls are around the perimeter. 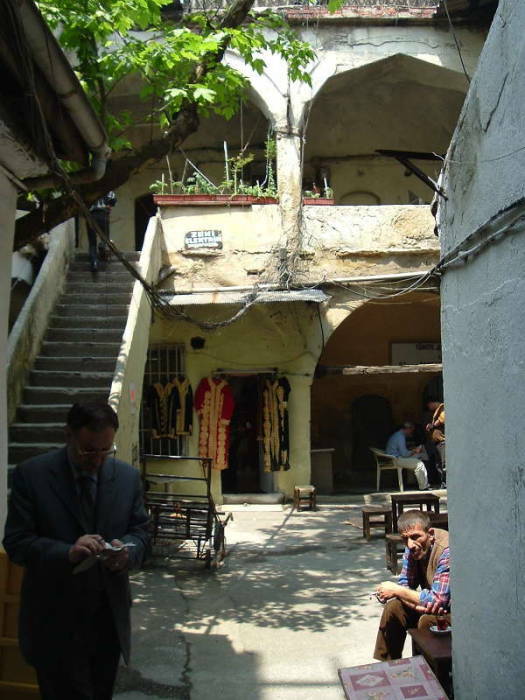 The vaulted arcade surrounding the courtyard is called a revak in Turkish. As you walk up the steps and through the outer gateway into the courtyard, you see more and more of the main dome, the half-domes, the quarter-domes, and so on. Domes within domes, details within details. 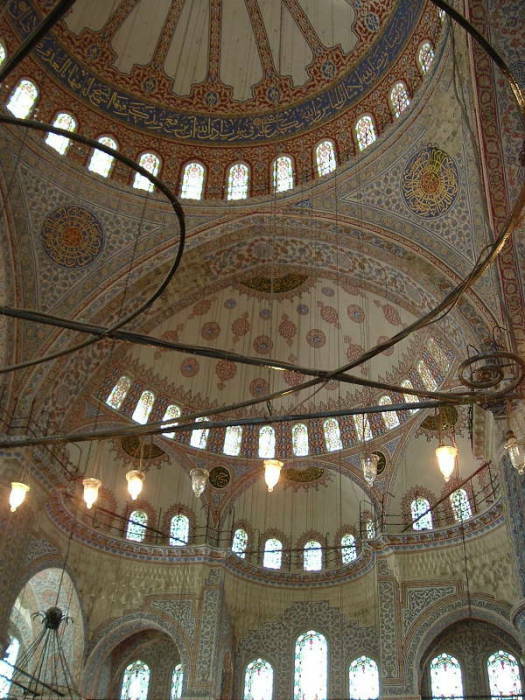 Above and below, you see the interior of the Blue Mosque. The minber is the elevated pulpit, where the imam stands to deliver the sermon at noon prayer on Fridays or on holy days. To its left is the mihrab, the niche indicating the qibla, or the direction to the Ka'aba in Mecca. A fragment of the sacred black stone from the Ka'aba is embedded in the Blue Mosque's mihrab. 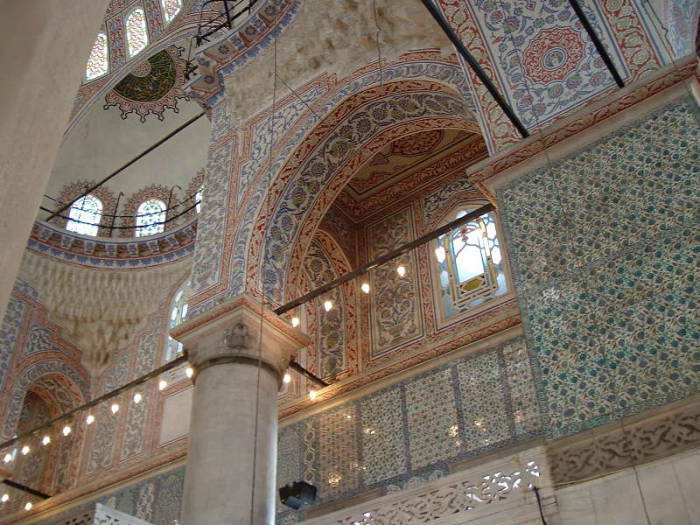 The Sultanahmet Camii, or Sultan Ahmet's Mosque, is called "The Blue Mosque" because of the blue İznik ceramic tiles inside. These pictures show some of the interior tile work. 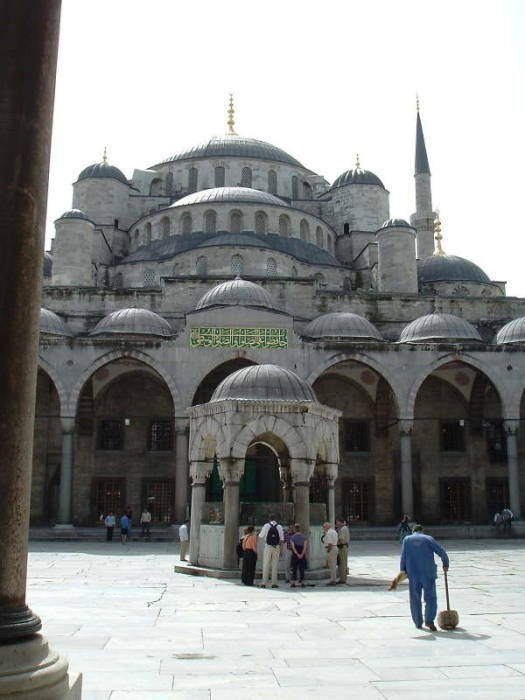 Pope Benedict XVI visited the Blue Mosque in November, 2006, during his visit to Turkey. This was only the second time a Pope had visited a Muslim place of worship. He joined Mustafa Çağrıcı, the Mufti of İstanbul, and Emrullah Hatipoğlu, the İmam of the Blue Mosque, in silent prayer. He then said, "May all believers identify themselves with the one God and bear witness to true brotherhood." 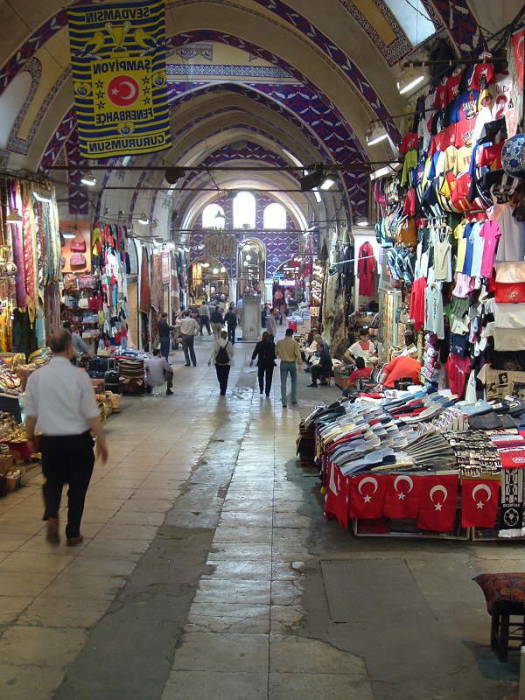 The bazaars in İstanbul are pretty fantastic, you could wander through them for days. One of the most astounding displays of enthusiastic capitalism in the world — all business, all the time, with almost anything imaginable for sale. Any Cold War concerns that the Turkish people were somehow susceptible to the attractions of Communism show a complete lack of understanding. 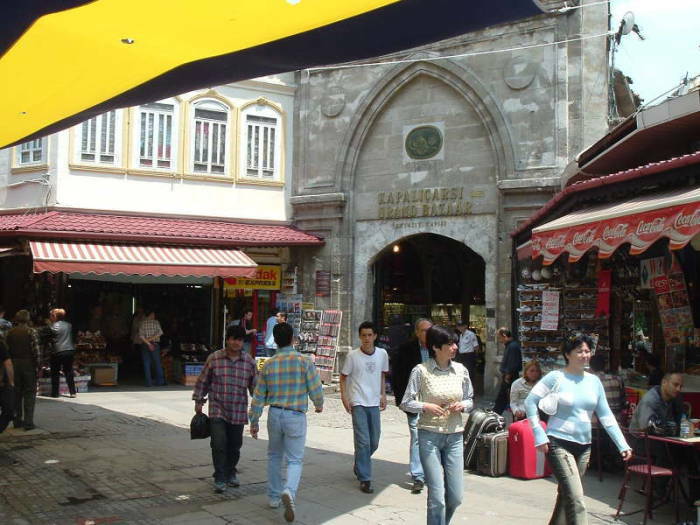 Above is the entrance to Kapalı Çarşı, the Grand Bazaar. 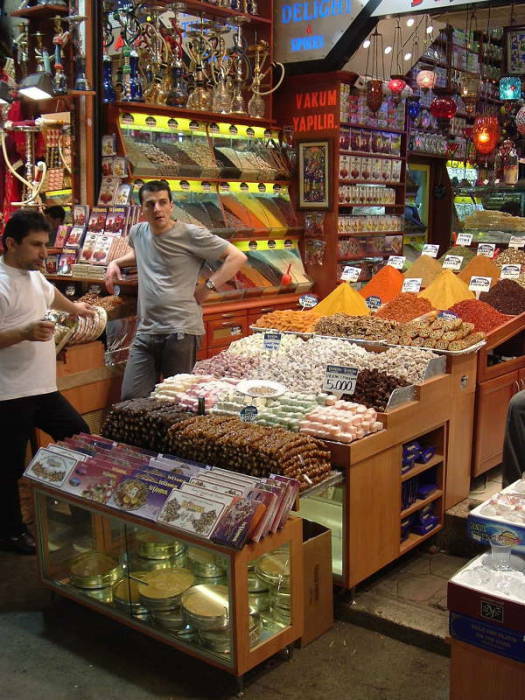 There are more than 58 streets and 4,000 shops in the Grand Bazaar, and it has between 250,000 and 400,000 visitors daily. 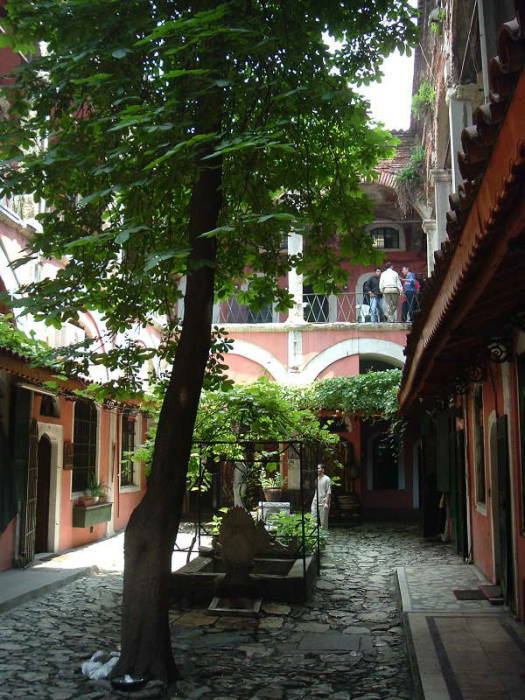 Hans are sheltered courtyards within the bazaar. Han is the Turkish word derived from the Persian khan. Persian also calls them caravanserai, as in caravan-palace. The original hans were roadside inns where travelers and merchants could rest overnight. In Persian, a caravanserai is usally a large station along a long-distance road while a han or khan is an inn within a town. 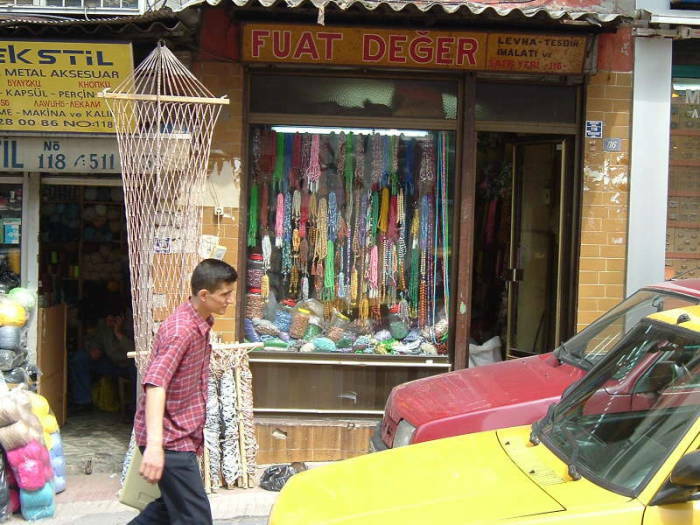 Turkish uses han to refer to both. 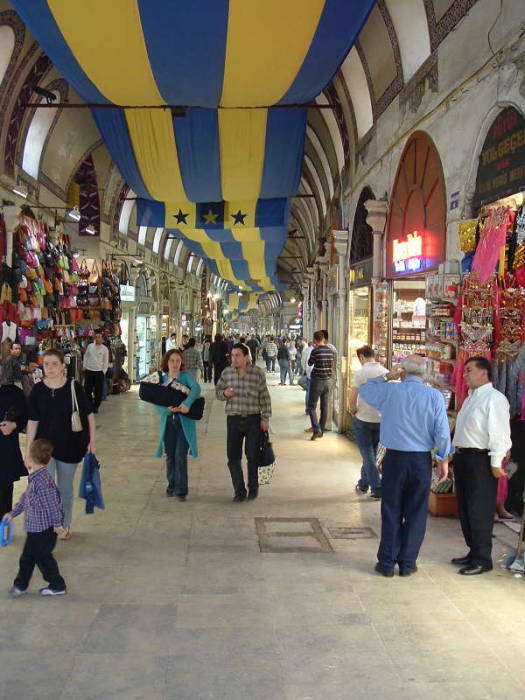 As for the hans within the Grand Bazaar, caravans would end their trip there. 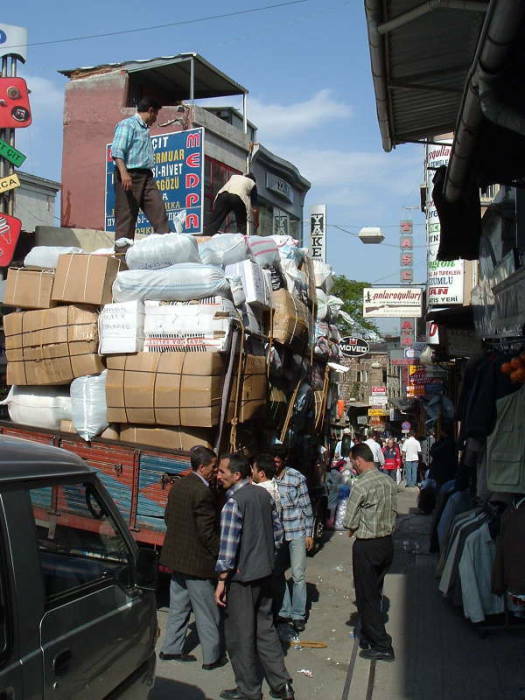 Offices still make the hans places of sales from the wholesalers to the retailers. Below we see Büyük Safran Han. Below are two views of Zincirli Han — the passageway to the han, and the han's open courtyard. According to what we see in the movie From Russia With Love, during the early 1960s the KGB's İstanbul station was located in a room off the balcony in Zincirli Han. 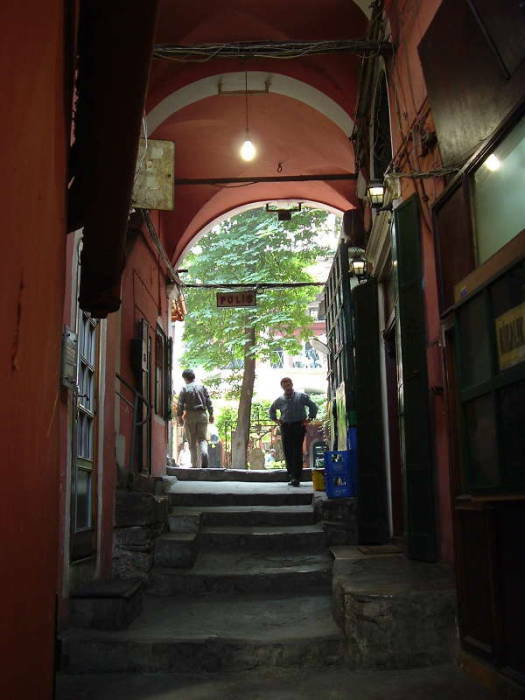 Uzunçarşı Caddesi (Longmarket Street) leads out the back of the Grand Bazaar and down the hill. 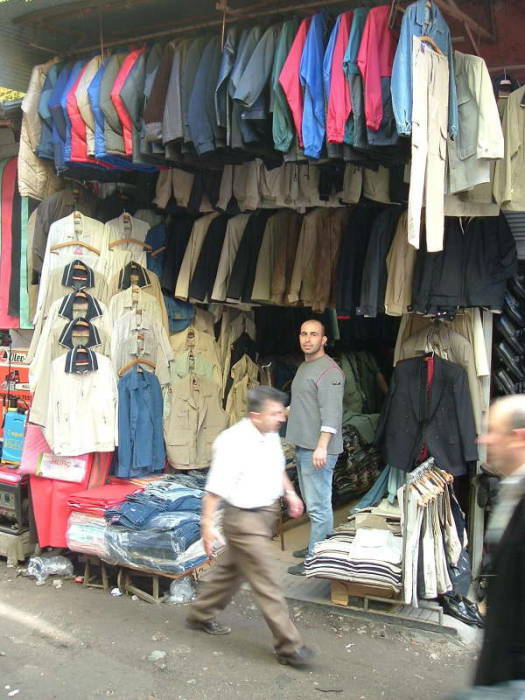 Everything is sold there — manniquins, prayer beads, hookahs, hookah parts, etc. 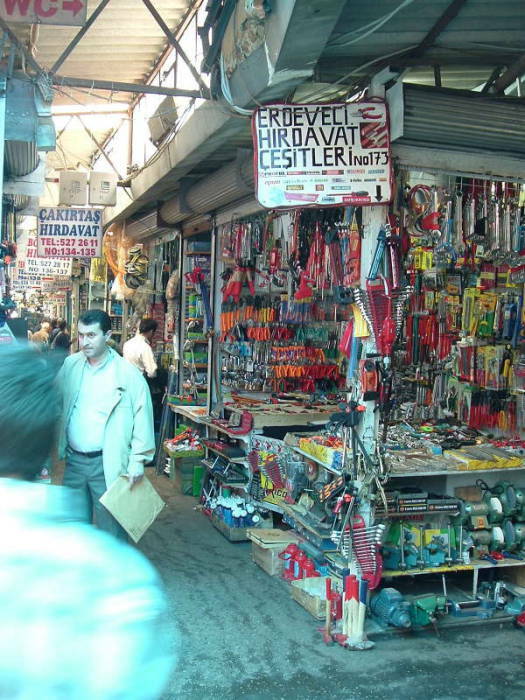 Polonya Pazarı is a partially Slavic bazaar selling all sorts of tools and machine shop supplies. 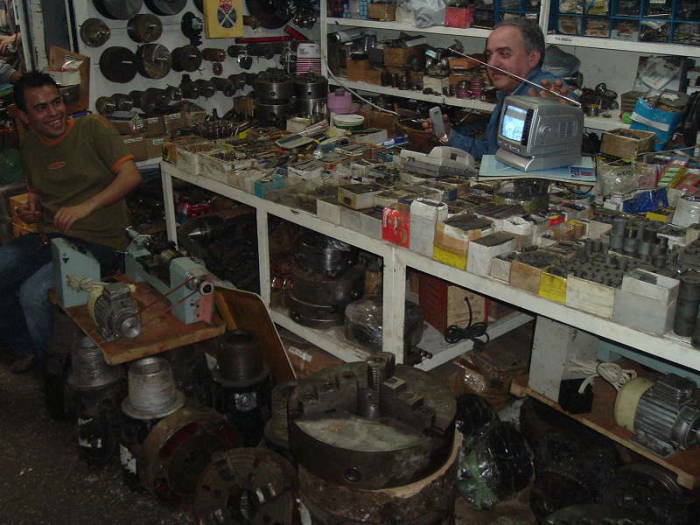 Tools, mechanical parts, electrical parts, and much more. Further down the hill are districts selling plastic goods, toys, clothing, ropes, chains, gardening tools, and so on. 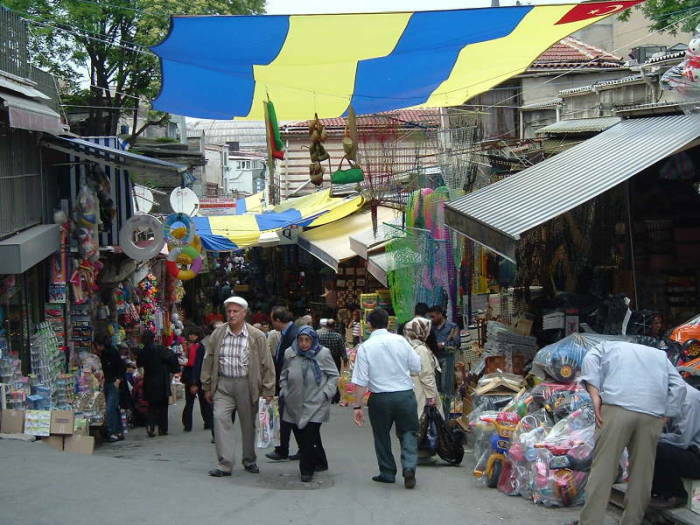 Finally, at the bottom of the hill you get to Mısır Çarşısı, or the Egyptian Bazaar, also called the Spice Bazaar. It has fruit, nuts, and, of course, spices. The Bosphorus Strait splits İstanbul into European and Asian sides. The Bosphorus drains the Black Sea into the Sea of Marmara, which then drains into the Mediterranean by way of the Dardanelles. The glaciers of the last Ice Age accumulated water, lowering global sea levels. That made today's Black Sea an isolated low basin. It was a large lake filled with water from numerous rivers, but well below today's water level. Some of the rivers changed course, and the Black Sea level dropped further through evaporation. Meanwhile, the Mediterranean and thus the Aegean rose. According to one current theory, around 5600 BC the Mediterranean had finally risen to the point that it spilled over into the Black Sea. The authors of a 2008 paper estimate that "Ten cubic miles [42 cubic km] of water poured through each day, two hundred times what flows over Niagara Falls... The Bosporus flume roared and surged at full spate for at least three hundred days." 155,000 square kilometers of land was flooded. Many feel that this event may have been the origin of the flood myths common to the region. Others argue that the flooding was not as large or sudden. The European shore of the Bosphorus is split by the Golden Horn. So, ferries are often a useful way to get around. 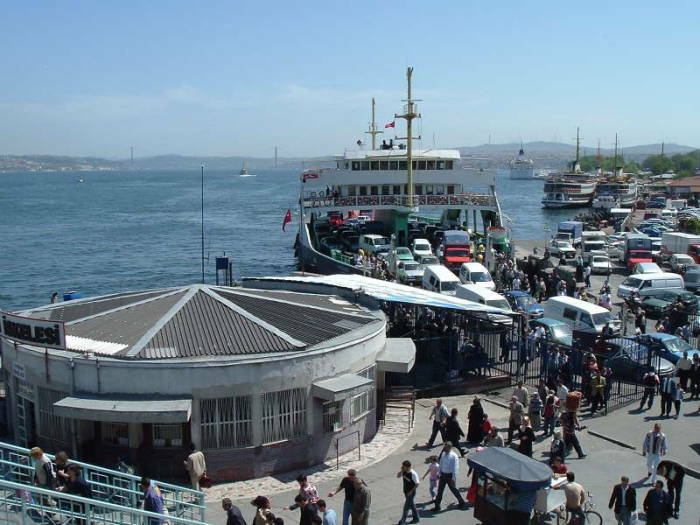 The ferry docks at Eminönü are always busy! This is where the Golden Horn empties into the Bosphorus. The Sirkeci train station is just one block up from the pier, so this is a very busy transport hub. 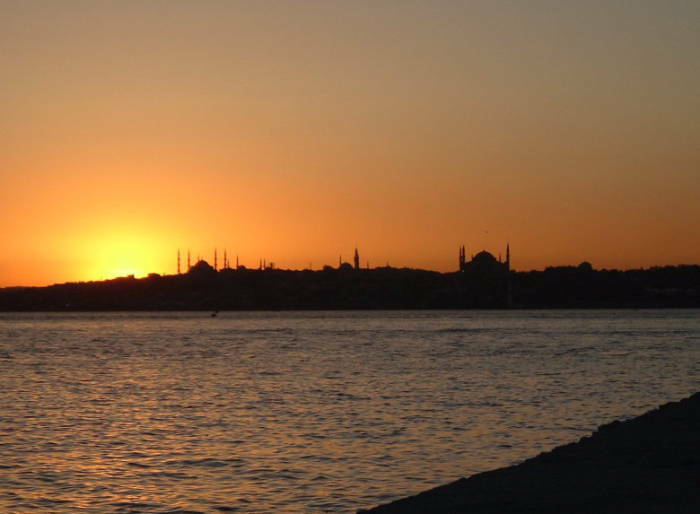 The Sun is setting over the Sultanahmet district. We're viewing this from the Kadıköy district on the Asian shore of the Bosphorus. The Blue Mosque, or Sultanahmet Camii, is at left. 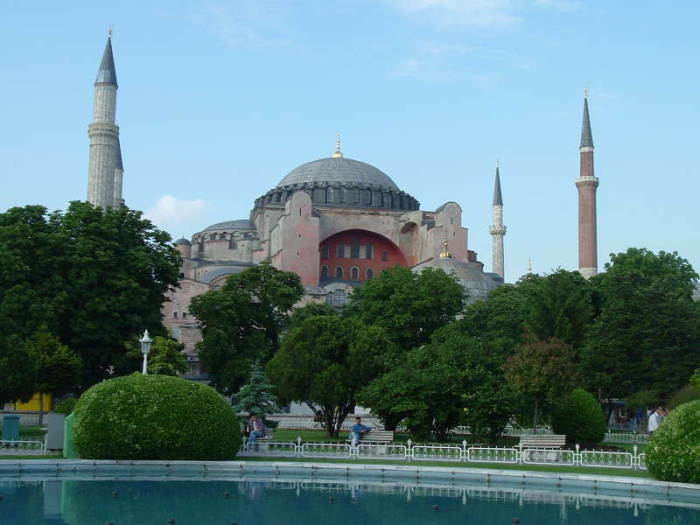 The Aya Sofya, or Hagia Sophia, is at middle-right. 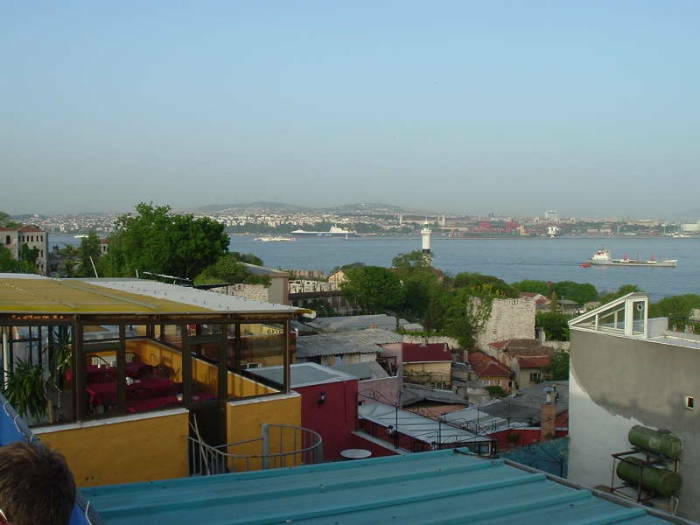 This is the view looking in the opposite direction, from a rooftop in the Sultanahmet district looking across the Bosphorus to the Asian side. 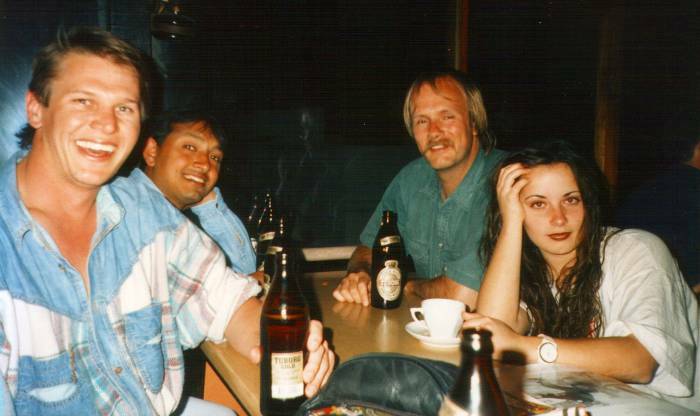 And then sitting on the rooftop in the evening, planning the next day. 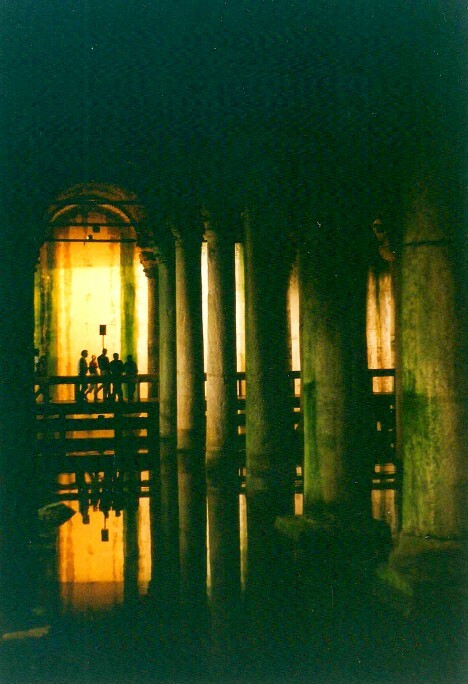 The Basilica Cistern, or in Turkish, Yerebatan Sarnıcı, is an enormous water storage facility built in 532 under the rule of the Emperor Justinian. 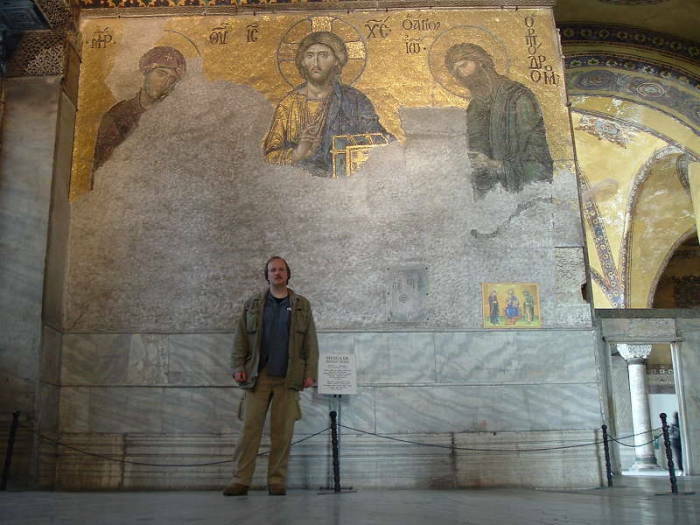 It's just across the street from the Aya Sofya, which he also built. It's surprisingly large — 140x70 meters, with 336 columns. Water was pumped from a reservoir in the Belgrade Woods, 19 kilometers north of the city near the Black Sea. 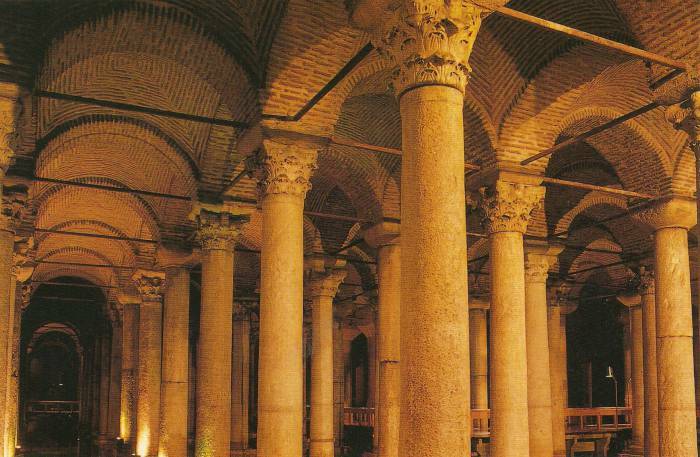 The water ran through 20 kilometers of aqueducts built under the Emperor Justinian to the center of the city. The cistern could hold 80,000m3 (that's 80,000,000 liters!) of water, enough to supply the city of Constantinople through a long seige or drought. 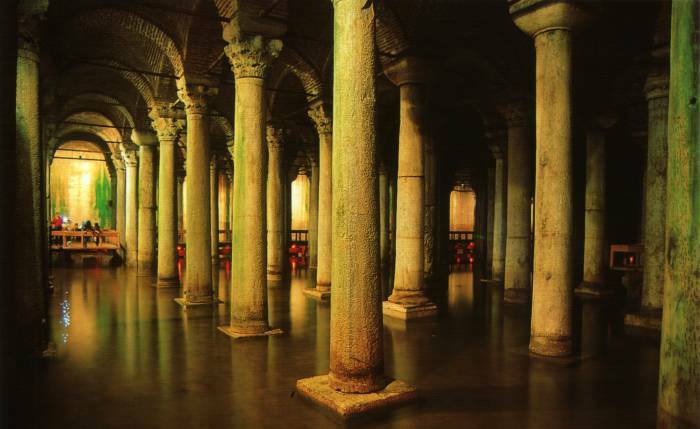 It continued to supply water to İstanbul through the Ottoman conquest in 1453 and into modern times. It provided water to the nearby Topkapı Palace until the Sultans moved out. Contrary to what we see in From Russia With Love, the İstanbul station of MI6 does not connect to the cistern, nor is there a periscope into the KGB/FSB office. 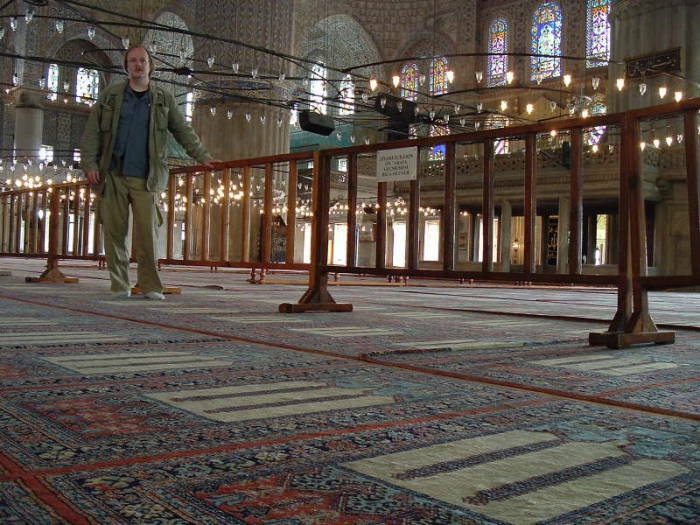 And contrary to the movie The International, it isn't under the Sultanahmet Mosque or adjacent to the Süleymaniye Mosque. But it's still fun to explore. Soft music plays from hidden speakers. Long raised walkways lead back through the cistern. There's even a coffeeshop down there. Some 336 marble columns, in 12 rows of 28, support the ceiling and the city above. Each column is 9 meters tall.